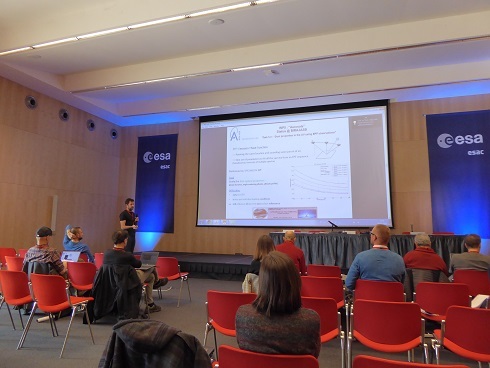 Livestream of the press conference at EGU, Vienna, where the first results were presented. see the full Press Release on the IASB-BIRA site in French, Dutch, or English, and on the ESA site. 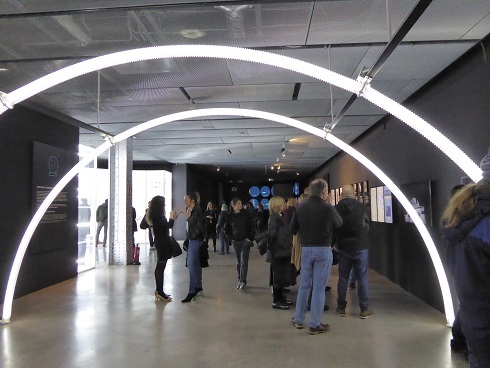 During the Open Doors, the NOMAD team was very active to promote the instrument and the science NOMAD will achieve. 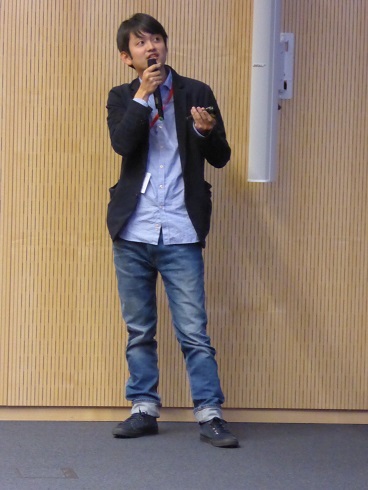 Plenty of presentations on the first results of NOMAD at the EPSC ! 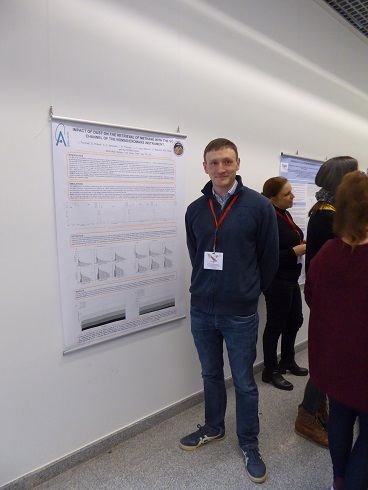 During the EPSC in Berlin, more than 25 posters and/or talks discussed the first NOMAD results !. 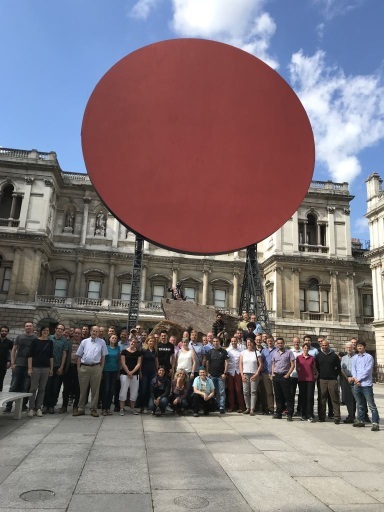 The NOMAD Science Team gathered in London to discuss the first results !. 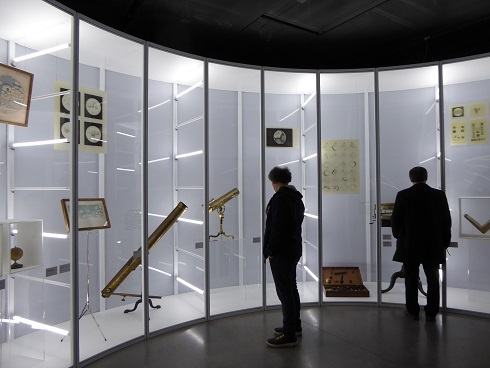 The NOMAD mockup is part of the Emerveillement/Verwondering/Wonder exhibition: it is hanging in one of the rooms of the Royal Palace in Brussels..
Observations of Mars and paper by S. Aoki in SOFIA News ! Highlight of the observations performed by SOFIA under the direction of S. Aoki. 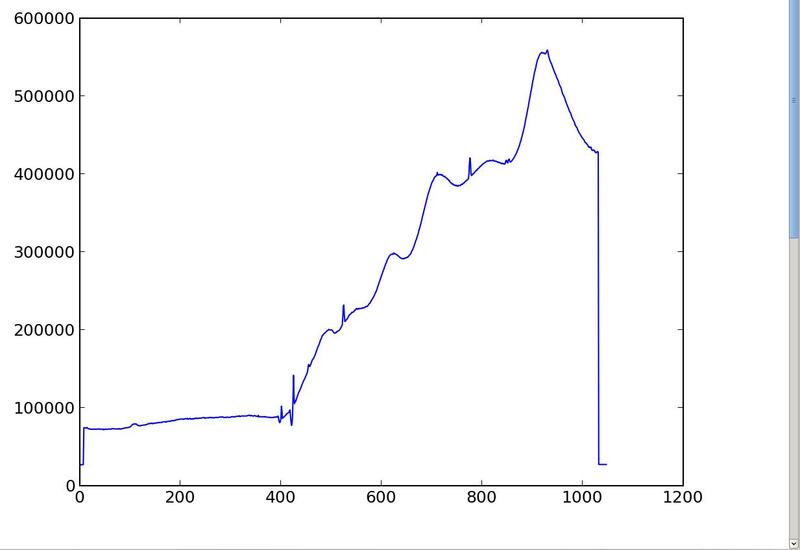 Although NOMAD started observations almost one month ago, yesterday the first solar occultation has been performed. Spectra look nice and full of promises. The ExoMars Trace Gas Orbiter has returned the first images of the Red Planet from its new orbit. The orbiter's Colour and Stereo Surface Imaging System, CaSSIS, took this stunning image, which features part of an impact crater, during the instrument's test period. 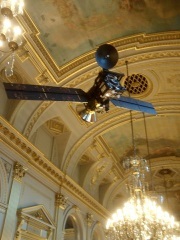 The camera was activated on 20 March and was tested for the start of its main mission on 28 April. TGO has reached its final orbit (circular at 400 km above the surface) and the Science phase started. During April, only nadir observations will be possible and the measurements will mainly focus on calibratin and learning to operate the instruments fully. 27-28 Feb. 2018 - To finish UPWARDS in a blaze of glory, an interdisciplinary workshop was organized in collaboration with ESAC. 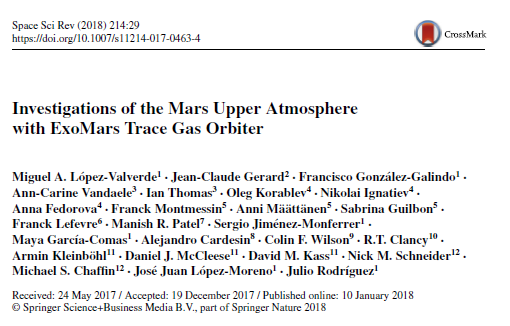 The science research topics were mainly focused on the analysis and revision of datasets from present and past missions around Mars, especially Mars Express but also international collaborations with MAVEN, MSL, MRO, etc, in preparation for the exploitation of the Exomars Trace Gas Orbiter measurements. The Martian community responded enthusiastically to the call. 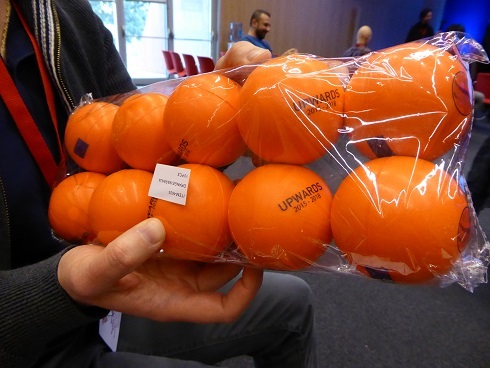 26 Feb. 2018 - The EU Horizon2020 project UPWARDS has come to an end. After 3 years of hard work, the Planetary Aeronomy team has proudly presented their results at the Final Review meeting. 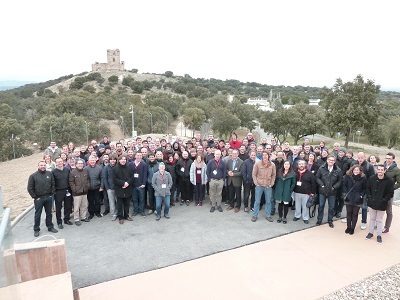 This took place near Madrid, at the ESAC facility. 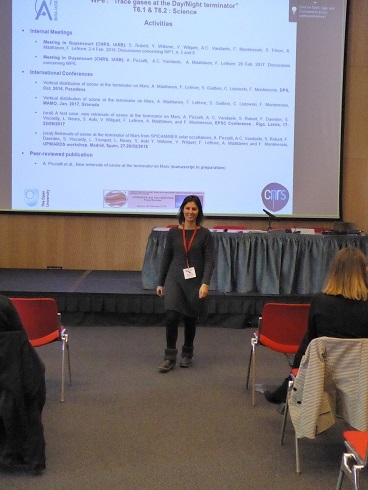 The results of the consortium were presented to the European Commission officer and the evaluator. 23 Feb 2018 - ???? The aerobraking started in March 2017 and just ended today. 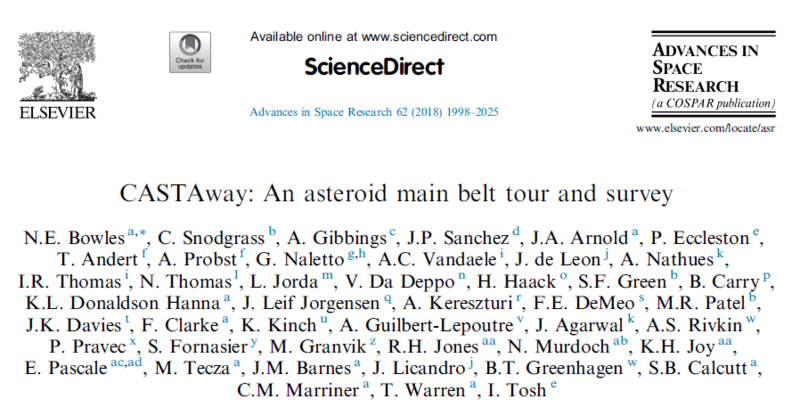 The spacecraft had to transform its initial, highly elliptical four-day orbit of about 98 000 × 200 km into the final, much lower and circular path at about 400 km. More info on the ESA website. The "Let's go to Mars!" app launched! 26 Jan 2016 - Ann C. Vandaele, researcher at IASB-BISA, is interviewed by EuroNews on the ExoMars mission and the NOMAD instrument. Jan 22, 2016 - UPWARDS: Understanding Planet Mars is a signature documentary film about key questions about Mars produced by the project's outreach & communication team. 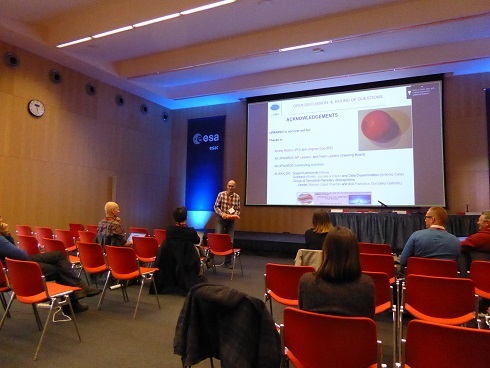 26 Jan 2016 - Jorge Vago, one of the Exomars Project Scientists at the European Space Agency (ESA), outlined the mission. 22 January 2016 - One month ago, the ExoMars 2016 Trace Gas Orbiter and Schiaparelli (the entry, descent and landing demonstrator module) travelled aboard two Antonov 124 cargo jets from Turin, Italy, to the Baikonur Cosmodrome in Kazakhstan to be readied for launch in March. TGO is at Baikonour ! 23 Dec. 2015 - The 3rd ExoMars flight containing the Trace Gas Orbiter TGO safely arrived in Baikonur this morning. 25 Nov. 2015 - The ExoMars spacecraft of the 2016 mission is being prepared for shipping to the Baikonur Cosmodrome in Kazakhstan ahead of their launch in March. NOMAD, the instrument developped at IASB-BIRA is part of the ExoMars TGO 2016 mission. 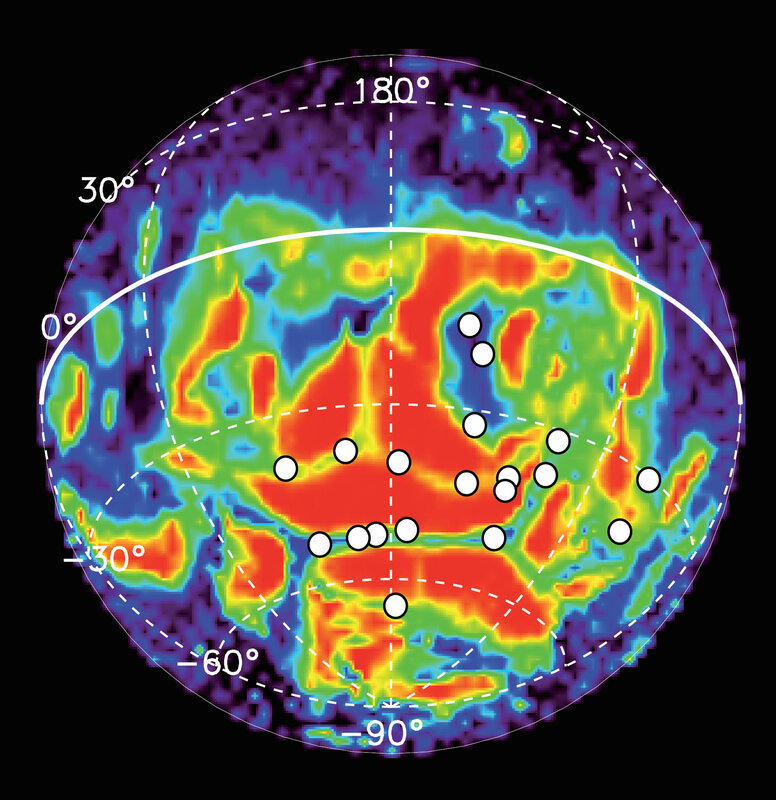 For the first time, MAVEN surprisingly detected diffuse aurorae in the Northern hemisphere of the planet Mars, where a magnetic field is absent while it was thought it is an indispensable ingredient for the observation of aurorae. The Belgian newspaper Le Soir dedicated a full page to the planet Mars (.pdf). Dr Arnaud Stiepen from the ULg and member of the SCOOP project was interviewed (in French) over the latest discoveries by the Nasa probe MAVEN (Mars Atmosphere and Volatile Evolution) orbiting Mars since September 2014. 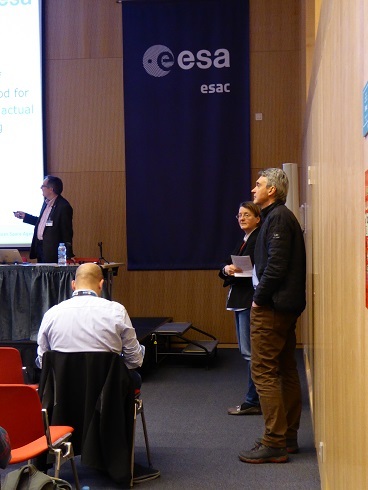 In addition, an ESA press release about the Mars Express Mission placed the work by the team of Jean-Claude Gérard (LPAP, ULg) in front. 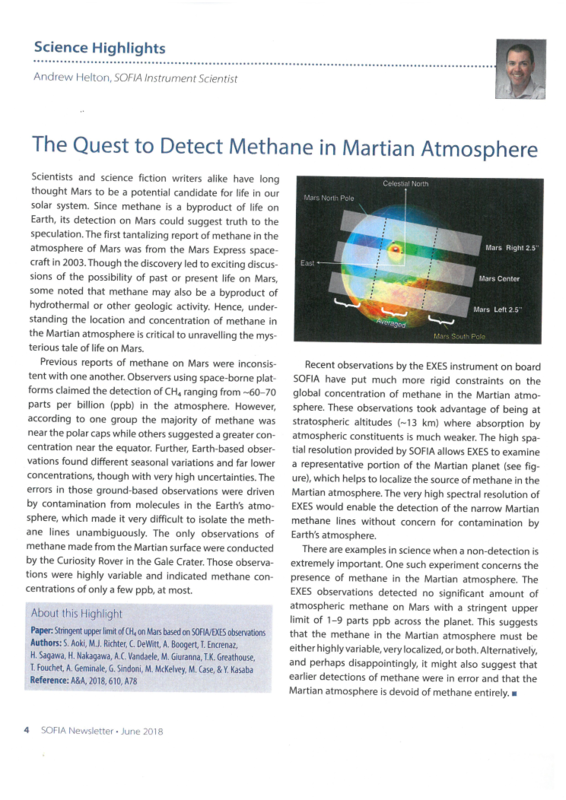 Armed with 10 years of Mars Express observations, they have detected discrete ultraviolet auroras in the Sourthern hemisphere on many occasions, and have analysed in detail how and where they are produced in the Martian atmosphere. They concluded that the auroras appear only under special conditions, near the boundary between open and closed magnetic field lines (see Figure below). Unlike the northern hemisphere, the southern hemisphere of Mars has regions where the rocks have preserved the memory of a past magnetism. This residual magnetic field is called paleomagnetism. The ultraviolet auroras associated with known magnetic anomalies in Mars’ crust are confined, rare and transient events that vary in time and space. They are very different from the auroras seen on other planets. Distribution map of discrete aurores (white circles) detected in the Southern hemisphere of Mars. The paleomagnetism appears on the background. © ULg, ESA. Both phenomena, discrete and diffuse auroraes on Mars, are detailed on the Daily Science website (in French). PSS Special Issue : "Exploration of Venus"
Carbon monoxide short term variability observed on Venus with SOIR/VEX. Vandaele et al. Venus mesospheric sulfur dioxide measurement retrieved from SOIR on board Venus Express. Mahieux et al. Hydrogen Halides measurements in the Venus upper atmosphere retrieved from SOIR on board Venus Express. Mahieux et al. Update of the Venus high altitude temperature profiles measured by SOIR on board Venus Express. Mahieux et al. Rotational temperatures of Venus upper atmosphere as measured by SOIR on board Venus Express. Mahieux et al. Thermal structure of Venus nightside upper atmosphere measured by stellar occultations with SPICAV/Venus Express. Piccialli et al. Upper Atmosphere Temperature Structure at the Venusian Terminators: A Comparison of SOIR and VTGCM Results. Bougher et al. Ground-based IR observation of oxygen isotope ratios in Venus's atmosphere. Iwagami et al. Distribution of Sulphuric Acid Aerosols in the Clouds and Upper Haze of Venus Using Venus Express VAST and VeRa Temperature Profiles. Parkinson et al. Jul 09, 2015 - Co-ordinated by the Instituto de Astrofísica de Andalucía (IAA-CSIC), the project involves seven European scientific institutions which are developing new analytical techniques to exploit the Mars Express and the future ExoMars missions. EuroPlanet - a new Horizon 2020 project ! 30 March 2015 - In January 2016, the ExoMars trace Gas Orbiter will be launched toward Mars with on board, a new instrument resulting from an international consortium led by Belgium. This instrument will study the Martian atmosphere, looking for traces of life. On Tuesday 24 March 2015 the instrument will be visible in Belgium for the last time before leaving our country to be delivered to the European Space Agency for the final integration on the satellite. Measuring Mars' Ancient Ocean: NOMAD co-Is interviewed ! 5 March 2015 - For decades, planetary scientists have suspected that ancient Mars was a much warmer, wetter environment than it is today, but estimates of just how much water Mars has lost since its formation vary widely. Now, new isotopic measurements by researchers at NASA's Goddard Space Flight Center reveal that an ocean once covered approximately twenty percent of the Martian surface. This new picture of early Mars is considerably wetter than many previous estimates, raising the odds for the ancient habitability of the Red Planet. And finally with UVIS ! 19 Jan 2015 - and the 3d channel UVIS has now also recorded some spectra ! And now with LNO ! 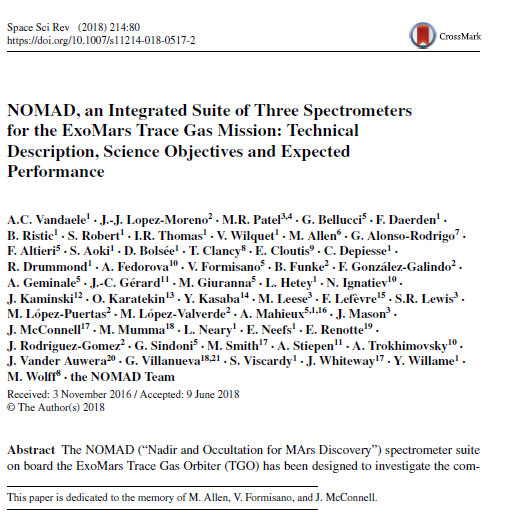 First absorption spectra of NOMAD ! 16 Jan 2015 - During the final tests before closing NOMAD, some measurements were done with the SO channel. Just a lamp in front of the entrance and here you go ... a fantastic spectrum of the air ! Today still from Earth, soon from Mars.